Whatever happened to the resolution of a blog a day? At least there’s 2006. Christmas 2005 finds me in Texas. There’s so much to talk about and if I could say one word that would describe what a great state this is it would be food – Kolache (A type of pastry consisting of fruit, meat or cheese fillings all stuffed inside a bread roll), Brisket, McRib (Did you even know McDonalds sold a McRib? Only in Texas), Taquito … Need I say more? To add to this, stores such as H.E.B (Here Everything’s Better) offer platters of free meals to sample and my gracious hosts chose to put on their culinary hats for the whole trip and kept serving steak entrees, traditional Indian meals and the customary Christmas dinner. I probably returned to Philadelphia with at least an additional 10 pounds. Nevertheless, the short 6 day trip allowed me to visit Waco, Dallas and Houston and I left knowing that there is indeed a place in the United States where land is vast, food is plenty and people ever so kind. 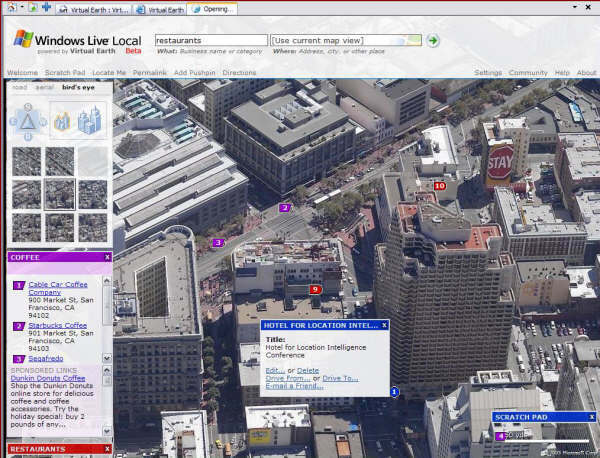 The mapping world is buzzing on Windows Live’s latest addition that is scheduled to be released within the next 18 hours.